What makes DJ Nickie K one of the best DJ's in New England is his passion and knowledge of music not to mention charismatic personality that attracts a variety of audiences. No matter the occasion his professionalism is top quality and customer satification is always a top priority. His experience and calm demeaner is just the perfect mix to make your special occasion stress free and fun. 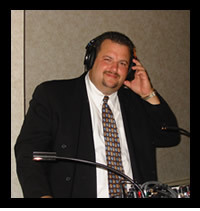 A true crowd pleaser DJ Nickie K has been providing disc jockey and emcee services for over 20 years. He has had a love of music since he was a child collecting records and transitioned into a passion. Since 1985 he has been the sound of local night clubs, special events, weddings and karaoke clubs throughout Massachusetts, Rhode Island, and New Hampshire. His experience and dedication to the industry is unparallel and has made him one of the most desired DJ Hosts in New England. DJ Nickie K's goal is to create lasting impressions. The mood of a corporate event will naturally be different from that of a birthday party or a wedding. DJ Nickie K has the ability to read a crowd and play the right musical selections creating an atmosphere to entertain your guests. Whatever the event, DJ Nickie K will make your one that will be memorable. For a consultation or inquiry of pricing please contact DJ Nickie K at 781-391-4122.